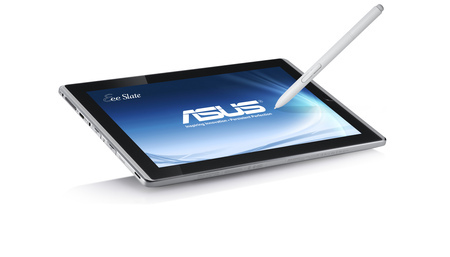 Asus’s large 12.1 inch Windows 7 tablet will be out in the UK from April – a matter of weeks. Designed for power users it has a great Intel i5 dual-core chip and and a large back-lit LED diplay. Like all Asus tablets, you can use either your fingers or a stylus on the touchscreen, it comes with an external Bluetooth keyboard for text input too. It will carry all Microsoft office apps on it and supports Flash and can multitask. The selling point of this tablet is really the connection with Microsoft – and as such it really gears itself towards the business user – someone who might want to edit a power point presentation on the go. We imagine the price will reflect that when it’s announced. One qualm: I’m still not convinced by the form factor – 12.1 inches is big and certainly not going to fit into your handbag/man bag. 12.1″ LED-backlit display with a 1280 x 800 resolution and a wide 178° viewing angle,.